Note: Article lists are available on all Guide plans, but only on Guide Professional or Enterprise can you create and save a custom article list. 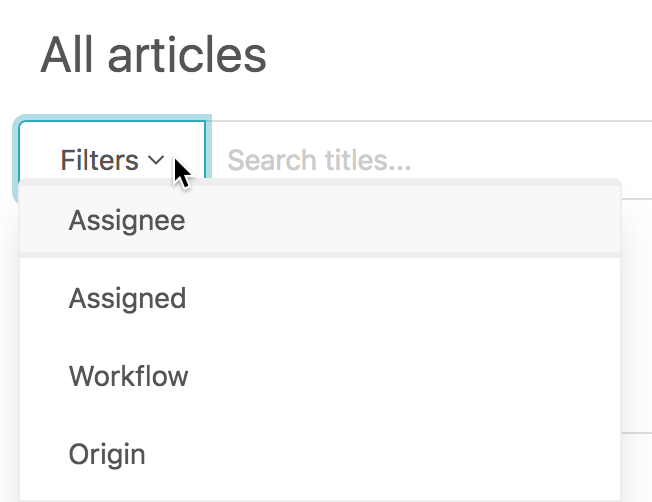 Article lists enable you to get an overview of all your knowledge base content, and then refine that view by using search and applying filters to build article lists. For example, you can find all the articles that were created this week and review them. Or you can find articles that have a specific article label, such as out-of-date. You must be a Guide Manager or an agent with edit permissions to access use article lists. Agents can access only articles where they have edit or publish permissions in article lists. On Guide Professional and Enterprise, you can save any custom article list you create. All articles gives you an overview of all the articles in your knowledge base. The number of articles and the list includes all articles in your source language, in all states, except archived. If you support multiple languages, you might notice that your number of published articles is greater than the number of all articles because it includes all translations. Drafts shows only the unpublished, draft articles in your knowledge base. On Guide Enterprise, instead of a Drafts list there are several Team Publishing lists, each corresponding to a different article state. Archived articles shows articles that have been removed from your knowledge base. You might see other lists, depending on Guide features you are using. You might also see personal saved lists and shared lists if you are on Guide Professional or Enterprise. You must be a Guide Manager or an agent with edit permissions to access article lists. Agents can access only articles where they have edit or publish permissions in article lists. Your All articles list opens by default. Published articles are indicated with a green dot ( ), draft articles with a yellow dot ( ), and archived articles with a gray dot ( ). Click another article list to open it. Click the name of your brand in the upper-left corner, then select the name of the brand you want to switch to. You can use search and filters to create an article list for a different view of your knowledge base content. For example, you might add a filter to your list of all articles to view only articles created this week. You must be a Guide Manager or an agent with edit permissions to access create article lists. Agents can create article lists for articles where they have edit or publish permissions. On Professional and Enterprise, you can save your custom article list for yourself or you can save and share the list with all agents. Your All articles saved list opens by default. Enter a search query in the search box, then click Enter, to search across all articles or select any saved list instead of searching first. Click Filters, then select a filter and a value to define this list of articles. You can apply filters to search results or to any saved list, including your list of all articles. The available filters depend on your features and plan type. Articles that match your search or applied filter appear. If you want to sort the articles, click Sort by at the top of the column, then select an option. (Guide Professional and Enterprise) If you want to save your list, click Save search as list, name your list, then click Save list. You can share any saved article list so that all Guide Managers have access to it (see Sharing a saved article list). If you are on Guide Professional or Enterprise and support multiple languages, you can view all articles for a specific language. Click Filters, then select Language. Only languages that are enabled in your Help Center are available (see Localizing Help Center). Articles that match your applied filter appear. Great feature! Just one request though - I'd love to be able to export this list or at least print it out. I would love to know what use case you are trying to solve by exporting or printing the list. Could you elaborate a bit on that? We are a not-for-profit that provides free tax preparation, so much of our documentation is seasonal and changes every year. In a perfect world we would like to be able to get a list of all articles (with the category and section), the last modified (so we can identify old documents), and the number of views, so that we can pass out this report to the different groups. Until now this was done by hand, but this report is a good start. However, without the ability to print it or download it, my option was a global copy/paste into a spreadsheet (which doesn't preserve the columns) and then massage the date to add category and section. Then I pulled up another report to add the # of views. So my global request would be to have all of this available on one report, but my immediate request would be to have a way to export it. Thank you so much for providing us with feedback about adding views to the overview. To make sure other users see your suggestion and for them to vote on it and provide their own feedback, I would recommend creating your request in our Product Feedback topic. This is where we list all product feedback allowing us to get an overview of it all. You can create a post by clicking here. What would be really great is if we could create a variety of custom article lists and then embed them in specific article pages. For instance, if I wanted to create a special article page for a user persona (IT Director), I'd like to be able to create a custom list that will display all articles tagged for IT Director dynamically. Right now, we need to create a series of anchor links manually and continually update the article page as new IT Director articles are created. Not a big deal in the beginning but if we have 5 persona pages and generate a couple of articles a week for each, it could quickly grow to be unmanageable. That is not currently possible. You are very welcome to add that as a feature request under Product Feedback, which will allow others users to vote and comment giving us a central place to understand the need when it comes to lists and the API. Can you explain how the lists under my Saved Lists are sorted? I have added about 30 lists and there seems to be no logical order to the lists. I have been creating the lists in the order in which I was hoping to see them and they are not showing that way and I cannot find any way to reorder them. Being the organizational freak that I am this is driving me nuts. If I can at least understand the logic behind the sort I may be able to better deal with it. Thanks for reaching out to us with your question. Unfortunately, the "saved list" image you provided currently doesn't include the option to sort alphabetically or by how many articles are listed in a title (i.e Published Articles with Comments...). It seems that by default it simply adds the content in the order it was created. I would definitely encourage you to post a feature request here and see if this is something that is being considered for this functionality. Thanks Jonathan. It doesn't actually sort them in the order I entered them either. I entered them in a particular order thinking that it might do that and it has then all over the place. It appears to be very random. I will be sure to enter a feature request. We have now fixed it so that lists are sorted by creation date. It appeared that they were sorted correctly up until 8 lists, so it took us a while to reproduce and fix the bug. Thanks for the update Christian. This will make it much better for viewing! It would be helpful to be able to share custom article lists with other documentation managers. I'd like that too. You might want to add a post to our Product Feedback forum, if you haven't already, just to make sure our product managers see your request. Thanks for the guidance Jennifer! I'll make sure I add the feedback there. Is there any ability to change the columns listed? Could do with being able to see Author and Section in the grid to help me work out who has done what and where it is placed. Hi Richard! Welcome to the Community! There isn't any functionality for this in the product right now, but I did find a post in our Product Feedback forum with the same suggestion. I would encourage you to head over there to share your detailed use case. This helps our Product Managers what our customers need! Hello! I would like archived articles to also appear when searching via the All Articles search field. Is there a way to do this without unarchiving articles? You can refine your search by clicking the Filter dropdown next to the search field, selecting Status and then Archived. This will show any archived articles that match your search criteria. Hope that helps! Is there a way to view the article list alphabetically by Title? I see I can sort by date, but not by Title. I'd recommend visiting that post and chiming in with your use case! For 'Viewing all knowledge base articles for a specific language' this only gives articles whose source is the language chosen, not translated versions which is what im looking for. I'm trying to view translated versions, not standalone articles in a different language. Could you tell me how to do that other than by process of elimination with the 'not translated to' filter? An export feature would also be amazing with the option to choose different columns as well! Hey Carlee! I'd recommend using Source > No instead. This will filter for articles that are in any language except your Source language. Hi Madison! Thanks so much for getting back to me quickly, I appreciate it! I was curious about what 'source' meant and even submitted a ticket about it. So after setting source to No and then filtering language to Chinese I do see more articles. I know that some of these are translations of English articles and a few are standalone Chinese articles. Is there a way to differentiate or create a download with different columns and attribuites I want to see? Im struggling to find any download option for anything or even a place to add columns for better visibility into what im looking for. Sure thing, Carlee! Unfortunately, I'm the bearer of bad news, as there isn't a way to export or download the list you create. Can you tell me more about what you need to do with the exported or downloaded list? I'm happy to see if there's a workaround available.